The Silver Hawk was unleashed on an unsuspecting public on the late 1930 show circuit, for 1931 production. While many four-cylinder motorcycles were in production by then, the Matchless engine configuration was unique for a motorcycle, although the Lancia Lambda pioneered the narrow-angle V-4 engine back in 1922. Matchless used a wider 26degree angle between the cylinders, still a tight enough design to be confused for the ‘square 4’ engine…which Ariel débuted the same year. By contrast to the more familiar Ariel engine, the Matchless Silver Hawk uses a single crankshaft, with a roller bearing in the center, separating what are essentially a pair of v-twin crankshafts. It’s an extremely compact and tidy layout, with an advanced one-piece overhead-camshaft cylinder head, driven by a shaft and bevel housed within that lovely lighthouse tower, and capped by that fantastic upper-bevel inspection plate (itself an exquisite example of Art Deco typography). The chassis of the Silver Hawk was as advanced for the day as its motor, shared with twin-cylinder Silver Arrow, and featuring a fully sprung rear frame with twin springs under the saddle, its movement damped by friction plates, and adjustable by knob – just like the front forks of Webb pattern. With its extremely smooth motor, brisk performance, and comfortable ride, it tipped into the ‘luxury motorcycle’ category, and with a £75 price tag (£5 more than its natural rival, the Ariel 4), it was indeed an expensive proposition. 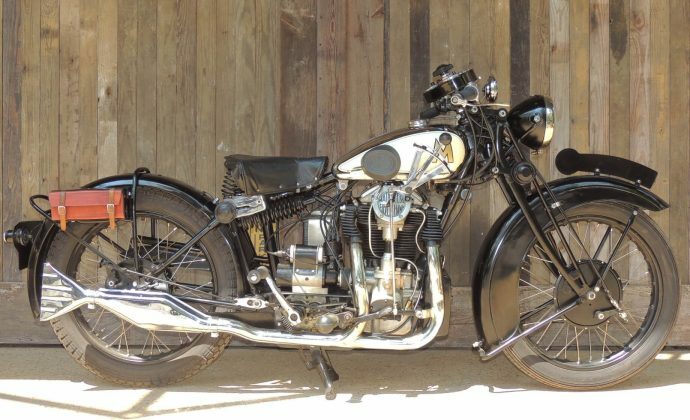 As brilliant as the Silver Hawk was, it couldn’t have arrived at a worse moment, as the Great Depression was biting hard into the global motorcycle industry, and old manufacturers were dropping like flies, although Matchless was financially strong enough to absorb rival AJS in 1931. The Silver Hawk proved a slow seller, and was only produced for 3 years, making it a rare and exclusive machine. It was a luxury motorcycle when new, and motorcycle connoisseurs are paying increasing attention to this sophisticated OHC 4-cylinder machine. 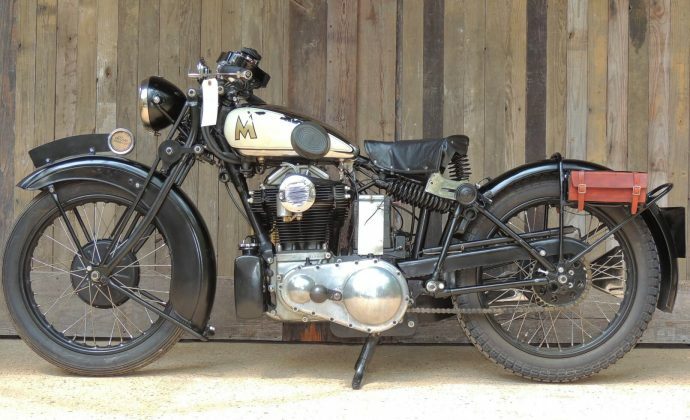 This 1933 Matchless Silver Hawk is an older restoration.